On February 5, 2019, British Columbia’s Minister of Health, Adrian Dix, announced increased funding for the deep brain stimulation (DBS) program. Funding will increase to $1.7M annually to support more DBS procedures per year. Over the last twenty years, funding for DBS in B.C. has risen from $0.2M/year to $1.7M/year. We hope to be able to perform 70 new DBS cases per year. Minister of Health announces $1.7M for increased DBS services in B.C. 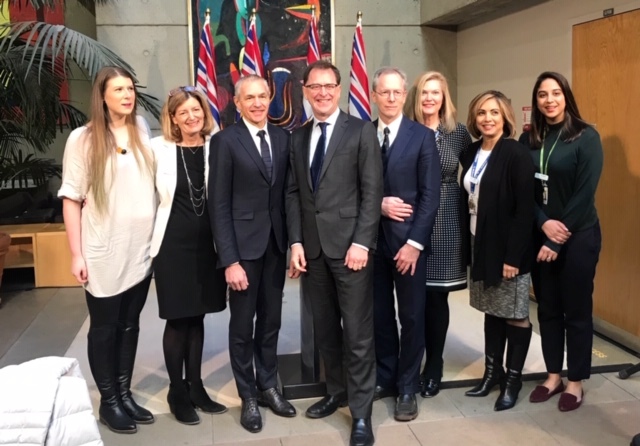 The announcement was made at Vancouver General Hospital where Minister Dix (centre), Dr. Honey and the three DBS nurses, and the President and CEO of Vancouver Coastal Health, Mary Akenhusen, were among those present.